SALT LAKE CITY Adventure Travel Business a new trade publication, which will hit the desks of travel agents, tourism offices and outfitters, features one of Utah’s oldest and respected river outfitters on its premiere January cover story. Holiday River & Bike Expeditions, based in Salt Lake City, has also been chosen for the magazine’s first “Profile in Adventure” feature. The 30-year old, family-run river outfitter has built a reputation for itself among adventure travel outfitters and enthusiasts as a company that is equally concerned about their guests’ safety and enjoyment as well as preserving the environment for the enjoyment of all. Dave Mulligan, editor of the new magazine, recognized Holiday’s environmentally and guest-friendly business operations as an example more adventure travel companies should follow and chose them for the first outfitter profile. “Holiday’s reputation for its commitment to the environment and well-trained guides has helped make a name for itself among the adventure travel industry. We hope that by highlighting their strong ethics and environmental efforts in the magazine, we will encourage new and established outfitters in other states and countries to follow their example,” explained Mulligan. Adventure Travel Business is produced through the combined resources of the Adventure Travel Society and AdventureWest magazine, a subsidiary of Adventure Media Inc. The Adventure Travel Society’s mission — to promote natural resource sustainability, economic viability and cultural integrity through the development of tourism — is expressed throughout the magazine’s various articles and special sections. Holiday sticks to an intensive guide training program, which goes beyond the required state licensing program, and only runs rivers with oar-power. No motors are used on their rigs which can pollute the waters and canyons with gas, oil and noise. In addition, all garbage and human waste is packed out. 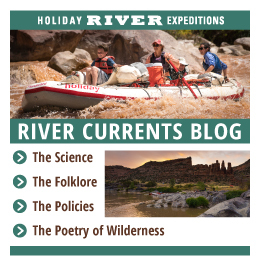 Holiday’s mission, unlike most businesses that have the “bottom line” approach, focuses on educating guests about the safe enjoyment of the rivers and lands they visit. In turn, guests come away from a Holiday expedition with a stronger appreciation for the environment and wilderness. Ultimately, Holiday hopes this approach to business will help preserve the nation’s wild lands. Travel industry experts from Travel Agent magazine and a host of newspaper travel sections have recently recognized Holiday for their wilderness-adventure expertise and respect for the environment. Holiday is also listed as one of only two five-star rated outfitters worldwide, in the Ultimate Adventure Source Book. Holiday River & Bike Expeditions is based in Salt Lake City, Utah and runs operational facilities in Vernal and Green River, Utah as well as Grangeville, Idaho. 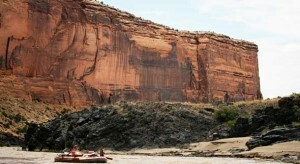 The company offers a wide variety of river rafting, mountain biking and combination rafting/biking trips in Utah, Idaho and Colorado, from May to October. For additional information about trips or schedules, please call John Wood at 1-800-624-6323.